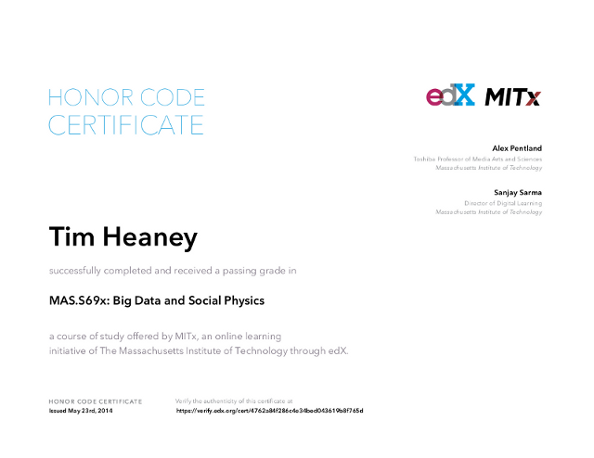 I recently completed the “Big Data and Social Physics” MOOC at edX. What a waste of time. Thankfully, it was only one week long, so I didn’t waste too much time. But still. Even though it didn’t cost any actual money, I feel like I was ripped off. This was basically a big sales pitch for Alex Pentland’s new book, Social Physics How Good Ideas Spread–The Lessons from a New Science. The course itself is entirely free of content. I did not cave in and buy the book, so I can’t really say, but it sure smells like it’s largely free of content as well. A new science? Is that really necessary? It sounds to me like maybe Pentland’s got a Wolfram-sized ego and has convinced himself that his ideas are so extraordinary they cannot be described with regular science. If you haven’t read Stephen Wolfram’s A New Kind of Science, you haven’t missed anything. I’m going to guess that it’s safe to skip Pentland’s “new science” as well. Even if I’m wrong about that and it turns out Pentland’s book does contain interesting content, I still think it was wrong of him to exploit the wonderful edX platform in this way. This was not a real course. This was a TED talk that spiraled out of control. Tomorrow, an edX course called Sabermetrics 101: Introduction to Baseball Analytics is starting. This appears to be chock full of real content including practical things like R and SQL. What does it mean if the baseball course has more “big data” in it than the Big Data course? I just completed the Jazz Appreciation MOOC at edX. It was fantastic! It’s like a whole new world has opened up for me! I am a lifelong fan of rock and roll, so I wasn’t completely unaware of jazz. I’ve been to a Pat Metheny concert. I own a Miles Davis record. Rock and roll is a term which includes an awful lot of things. The intersection of rock and roll and jazz is not exactly empty (both include blues, for example). But I knew there was a whole lot more to jazz that I didn’t get. Jazz made me feel stupid (“I mean, just play the right notes!”) and jazz fans have a (mostly deserved?) reputation for snobbery. So jazz had remained largely inaccessible to me. I didn’t get it and there seemed to be no good way to find out what others were getting. Jeff Hellmer and the folks at the University of Texas (that’s right, UT. In Austin. The indie rock mecca. Who knew they even had jazz there?) have made remarkably effective use of the MOOC platform to spread their encyclopedic knowledge and obvious love of jazz to anyone in the world who wants it. And it’s completely accessible. Hellmer is whatever the opposite of a snob is, generously sharing his vast knowledge without making anyone feel dumb. Ten weeks ago I knew hardly anything about jazz, really. Now, I’m so excited, I have to be careful that I don’t turn every conversation into a one-sided jazz lecture. It’s an amazing transformation! And an it’s an amazing gift. Of course I haven’t learned everything. Not by a long shot. Jazz is a huge topic. But I feel that I now have the tools I need to explore on my own. I didn’t have that ten weeks ago. It’s much more than just listening and deciding if you like it or not. I can now listen and identify all sorts of things about a piece. I still might not like it, but now I know why. Another difference with the previous MOOCs I’ve taken were the video lectures. Rather than speaking to slides or a white board, Hellmer lectured right from the piano. This enabled him to illustrate many points immediately on the keyboard. There are also other members of the UT faculty with different instruments in some of the videos. Most of the videos are just Hellmer at the piano, though. He’s very skilled and managed to get his point across even when he was talking about things that pianos can’t really do, such as scooping or growling. Like the other MOOCs I’ve taken, this one had a discussion board. I don’t think this format scales up to thousands of users, but there were some nice discussions on there with interesting people from all over the world. I learned about Oscar Peterson, whose statue in Ottawa I have seen many times, but not given proper attention. This class also featured weekly “office hours” on Twitter (#jazzofficehour), where @UTJazzApp would answer questions real time. This also would not have scaled if everyone in the class had shown up, but in fact it turned out great. It seems just the right amount of people showed up each week to keep things lively without getting out of control. I really can’t say enough good things about this course. There is talk of repeating it in January 2015. If you have any interest in jazz at all, you owe it to yourself to check it out! I just completed M101P: MongoDB for Developers! This is a free online course that uses the edX platform, but is not offered through edx.org. Instead, it is offered directly from MongoDB (formerly 10gen). As the name implies, it’s an introduction to MongoDB, a database that is not a relational database, but a document store. Last year, I took the Stanford database course which mentioned all sorts of databases, including MongoDB, but mostly focused on relational databases (there was a unit on NoSQL, but it had no exercises). As such, this course made a nice follow-up to that one. One of the first lessons explains the motivation for MongoDB with a plot showing where Mongo fits in between the scalability of a key-value store and the functionality of an RDBMS. Figure 1: Manipulexity v. Whipuptitude? This struck me as analogous to Larry Wall’s motivation for creating Perl; he wanted something in between the manipulexity of C and the whipuptitude of shell! Since Perl is one of my favorite programming languages (by far the one I’ve used the most), this analogy bodes well! If Mongo fits into the database world similarly to the way Perl fits into the programming world, I think I will like it! The course recognizes only two kinds of computers: Macs and PCs. Since I use Linux machines almost exclusively, I have had to learn to cope with this view of the world. It’s pretty popular among the general population. But not for developers usually. It feels especially odd here since MongoDB is probably running on more Linux machines in the world right now than all other machines combined. Ubuntu 13.10 has MongoDB 2.4.6, which is pretty up-to-date (the latest is 2.4.8). For this course, MongoDB 2.2 or newer will suffice. Note that Ubuntu 12.04 (the most recent LTS) supplies MongoDB 2.0. This lacks the aggregation framework, so it would not be sufficient for this course. In the course video, they download MongoDB to a Mac, create a data directory in /data/db, and then start the server by changing to the bin directory and executing mongod. Using the Ubuntu package, the server is already running and it’s using /var/lib/mongodb as a data directory. So there’s nothing else to do! Even though both pymongo and Bottle work fine in Python 3, the course uses Python 2 for some reason. I found this particularly odd because I think of MongoDB as a new thing. I mean, their whole business is based around convincing people to eschew decades of database research and try this new way instead. If anyone was going to embrace Python 3, I would have thought it would be the MongoDB folks. Anyway, I started out converting everything to Python 3, but eventually I gave up and installed Python 2.7.6 and used that for the rest of the course. The sample Python code left a lot to be desired, even given that it was Python 2. In addition to using the print statement instead of the print function and %s instead of string format, it was loaded with bare except statements. That was never good form, even in Python 2. And they incremented variables with “i = i + 1,” explaining that Python lacks i++ (yes, but it has i += 1, so we needn’t repeat the name). Also, they use classic classes everywhere! Write the to code to initialize a list with the items "hammer", "nail"
and "wall" and assign the list to the variable named "things". These, of course, are equivalent in Python. Despite all of these issues, I think Python is a good choice for this course. I wish they had used an up-to-date Python and I wish they had used more idiomatic Python, but in the end it didn’t really affect the course too much. How to use MongoDB from Python was effectively communicated. Indeed, I’m sure you can extrapolate everything to any similar language. I tried several of the examples and exercises in Perl and things worked nearly the same way. I’m confident I could easily do things in Ruby as well. The bulk of the course went very well. The edX platform was easy to use (I had some difficulty with the edX demo course, but none with the MongoDB course). It’s very similar to Class2Go, which is what was used for the Stanford database class. Most lessons consisted of a video lecture, a quiz, and its answer. There is some discussion in some of the answers. It took a me a while to catch on to this. Early on, if I got the answer right, I didn’t look at the answer video. After I got a few wrong, it dawned on me that there was good stuff in some of those answer videos! After that I started watching all of them, even when I got the right answer. The final exam was harder than I expected. Most of the course was pretty easy to follow, so I guess I was expecting a pretty easy final as well. That was not the case. It was actually pretty challenging. I got what was probably the easiest question wrong because I didn’t submit the answer correctly. It was a pretty straightforward update, but we weren’t supposed to merely provide the update command. Instead, we were meant to execute on some unseen database. The confusion was worsened because you couldn’t go back and look at your answer afterwards. In any case, I’m certain I did it right (I ran it locally), I just didn’t submit it right. Overall, I think the course was very worthwhile. Compared to a relational database, MongoDB is a joy to use from programming languages and I think going through this course saved me a lot of the trouble of discovering stuff on my own. If you’re interested, there’s another section starting soon!